Happy Thanksgiving! Jerri here from A Bushel And A Hug. I hope you have a wonderful and blessed day. I will keep today's post short so you can get those turkeys in the oven!! Today's card was made using the stamp set Bee Quotes. To make this card I first ran a piece of white card stock through my Cuttle Bug with the embossing folder called Honeycomb. Then I ran a dotted turquoise paper through the Cuttle Bug using the same embossing folder. I used the outline on the patterned paper as a guide and cut out about nine of the honeycomb shapes. I randomly placed those on my white paper and glued them down. Next I used the bee from the stamp set and stamped it on a piece of vellum using Archival Ink. 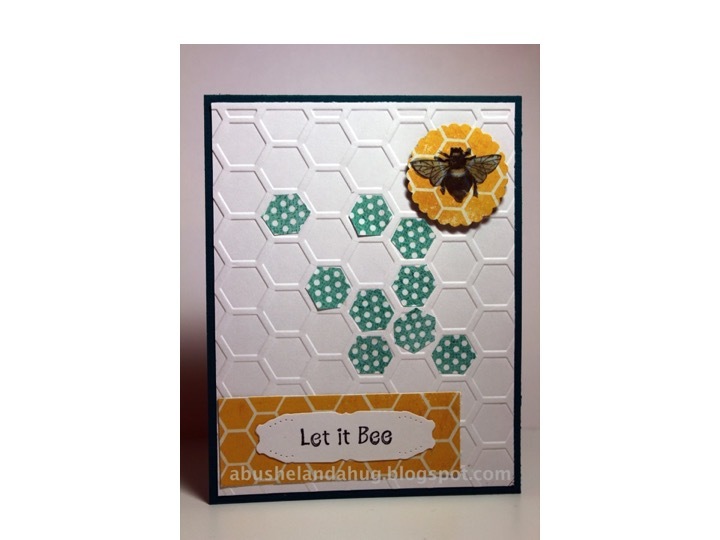 I fussy cut the bee out and then put it on the yellow patterned paper and pop dotted that piece onto the card front. Using one of the many quotes from this stamp, I stamped Let It Be and cut it out with a label die and placed it on the card. I chose a dark Turquoise Blue card stock to matt the card.